DETAILS: Every man needs a reliable portable cooler, but with the camouflage sit n’ sip cooler, they’ll have so much more. 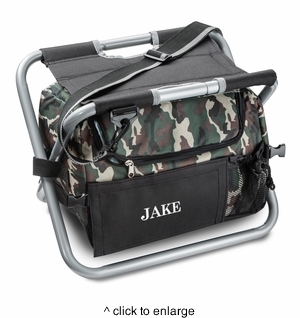 First, it acts as an insulated cooler, keeping up to 12 drinks cool in addition to snacks. It also has pockets to hold essentials like keys, wallets or cell phones. But what makes this cooler vital to a good time is that it doubles as a portable stool. Furthermore, this portable cooler can be personalized with up to 7 characters, making it a perfect gift for Father’s Day, an anniversary or birthday. MARKETING: Perfect for the hunter, camper, outdoorsmen, tailgater or dad looking for a all-in-one favorite.